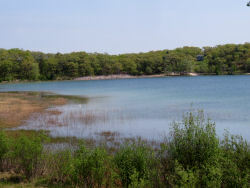 Canfield Lake is a small and shallow lake just south of Manistee. 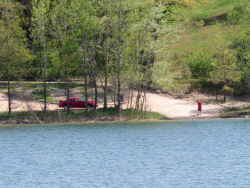 It is a good place to play with your dog, catch some fish, or take a short paddle. Swimming is possible. Other points of interest- Sundling Park, and Magoon Creek Nature Area are nearby. City of Manistee is 2 miles north. Fishing- Reports of panfish, northern pike and largemouth bass there. Handicap Accessibility- None- all dirt surfaces with slopes exceeding 2%. From US 31, turn west just south of Manistee on Red Apple Road. In 0.5 mile, turn south on Maple Street. Turn east on Canfield Road in 0.5 mile and watch for access road.